The Eastern Wyoming College women’s rodeo team brought home a team trophy for their performance at the first rodeo of the spring season hosted by Gillette College this past weekend. Allie Grant, a freshman, from Wheatland, WY won the short go of the breakaway roping with a time of 3.6 seconds. She also won the average. Her teammate, Shayna Nagel, freshman, from Springfield, SD finished right behind her with a time of 4.1 seconds and second place in the average. In the goat tying, Mardee Sierks, sophomore, Brewster, NE, finished the weekend in third place in the goat tying. She was solid in the long go and tied her goat in 9.7 seconds in the short go to secure the third place finish in the average. Michaella Lay, a freshman from Torrington, was sixth in the long go and fifth in the short go which landed her the sixth spot in the average for the weekend in the barrel racing. Grant also qualified for the short go with her team roping partner Trevor Blomenkamp, freshman, from Broadwater, NE. In the steer wrestling, Tyler Thorson, sophomore, from Towner, ND won the short go with a time of 4.0 seconds which earned him a second place finish in the average. Troy Wilcox, a sophomore from Red Owl, SD, was second in the long and short rounds of the tie down roping for the weekend. Jake Etzkorn, freshman, from Pierre, SD finished the weekend in fourth place in the bull riding. “It was great to see our young women’s team earn a title. Hopefully that momentum will carry through the spring. Our men’s team is still in the mix and will have better rodeos. Troy Wilcox continued his run for the Regional All Around title with a couple of great runs in the tie down roping,” added rodeo coach Jake Clark. After one year of successful implementation, and with more than 40,000 tests delivered across 35 states, GED Testing Service has found that adults who take the GED test on computer are passing at higher rates and finishing faster. GED Testing Service introduced the new computer–‐based delivery system in 2012 to help more adults earn a GED credential and to prepare for the launch of the new GED test in 2014.
of giving up and dropping out of the program. faster than their paper-¬‐and-¬‐pencil contemporaries. GED Testing Service is now offering a unique opportunity to encourage the one in five Americans without a high school diploma to try the test on computer. Through May 31, 2013 any adult who chooses to begin their GED test on computer will receive one free retake if they fail. In addition, adults who began their GED test on paper will be eligible if they live in a state where computer-¬‐ and paper-¬‐based test scores can be combined. To view full details of the new offer visit, GEDtestingservice.com/secondshot. registration and scheduling, instant unofficial score reports, and a more self-¬‐paced testing experience. States are offering the test on computer to prepare for the new 2014 GED test, which is scheduled for release on Jan. 2, 2014 and will only be delivered on computer. Eastern Wyoming College Testing Center in Torrington, WY is one of the sites where you can take this GED test. For more information please call the EWC Testing Center at 307.532.8288. Back Row: Taylor Bush, Wheatland High School, Slater Ashenhurst, Wheatland High School, Mari Totland, Wheatland High School, Joshua Ring, Torrington High School, Alex McAnelly, Torrington High school, Tyler Shockley, Wheatland High School. 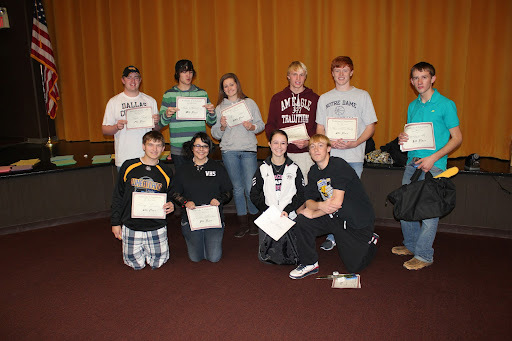 Eastern Wyoming College hosted the 57th Annual Wolsborn-Drazovich math contest for the Goshen and Platte County region. There were 228 students representing schools from Guernsey, Lingle, Wheatland Middle School, Wheatland High School, Torrington Middle School, as well as Torrington High School. The contest is a battery of five tests, twenty minutes per test, covering many of the topics that are included in the state standards. The students are broken into four classes, 7th grade, 8th grade, 9th – 10thgrade and 11th – 12th grade. Medals, certificates, and small prizes were awarded to the top three place winners and certificates were awarded to the top ten place winners. The first place winner of the 11th-12th grade class was also given the opportunity for a one-year scholarship to Eastern Wyoming College, second place a $500 book scholarship. If either of these winners decline the prize and choose not to attend EWC then an alternate winner will be awarded the scholarships. Overall, this is an excellent opportunity for students to be exposed to some unique mathematics problems and maybe pique their interest in mathematics a little bit. The contest is open to all area students, homeschooled students included, areas generally represented include Torrington, Lingle, Fort Laramie, Guernsey, Southeast, Wheatland, and Chugwater. If you are a teacher and wish to be on the mailing list for next year’s contest, being held February 25th, please contact EWC Mathematics Instructor, Ray DeWitt at 307-532-8281 and discuss the details. EWC Welding student wins Bronze Medal at U.S. Weld TrialsPhoto caption: L to R Tanner Tipsword & Mark Schmidt EWC Welding Student Tanner Tipsword is presented the K3236XI Welding Ready Pack from Mark Schmidt, of US Welding in Scottsbluff, NE and on behalf of Myron Delgado of Lincoln Electric. EWC Welding Student Tanner Tipsword is presented the K3236XI Welding Ready Pack from Mark Schmidt, of US Welding in Scottsbluff, NE and on behalf of Myron Delgado of Lincoln Electric. Tanner Tipsword, Cheyenne, WY received a K3236XI Welding Ready pack that was donated to him by Lincoln Electric Company and U.S. Welding. Scottsbluff sales representative Mark Schmidt and on behalf of Myron Delgado, Lincoln Electric Sales Representative, Denver, CO presented Tanner with the gear that was personalized. He took to the gear to the U.S. Weld Trials in Daytona, Florida February 17-26 where he competed and received a Bronze Medal. The competition lasted four days and multiple welding processes were tested. The welding requirements are so precise that a number of the welds required x-ray reviews and hydrostatic pressure tests up to 1,000 pounds per square inch in order to verify the integrity and quality of the welds. Eleven high school teams from around the state of Wyoming competed at the Wyoming Academic Challenge, hosted by Eastern Wyoming College, Saturday, February 16. The three to five-member teams participated in four rounds of competition and answered questions ranging from current events to mathematics and literature. Schools participating were: Big Horn, Campbell County, Cheyenne East, Evanston, Laramie, Riverside, Sheridan, and Tongue River. First Place was Cheyenne East # 2 with a total of 775 points. Second place went to Tongue River with 760 points. Third place was Bighorn #2 with 715 points. Plaques and medals were presented to the winning teams and students on the first place team were presented scholarships to attend EWC for the 2013-2014 academic year. This presentation is free and open to the public. For more information please contact the EWC Library at 307.532.8210 or 307.532.8375. The Eastern Wyoming College Foundation has announced the recipients of the Foundation’s annual awards of recognition. The Distinguished Alumnus is David Briggs and recognized for Distinguished Service are Mrs. Pauline Deahl, Mrs. Sharon Jones, Mrs. Betty Hayano and Mrs. Bev Yeik. 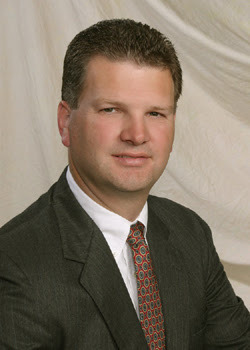 David Briggs, Alliance, NE, is the CEO and President of WestCo. He attended EWC in 1982-1983 and received an Associate of Arts degree in Accounting. He went on to receive a BSBA in accounting from Midland Lutheran College in Fremont, Nebraska in 1985. Mr. Briggs has held positions with Peter Kiewit and Sons, Omaha as an office manager and compensation supervisor and as a human resources manager. He was the assistant general manager and general manager at WestCo prior to becoming CEO and President. Mr. Briggs and WestCo provided EWC with the equipment necessary to have a weather camera on campus which shows weather across the North Platte Valley in Torrington. The camera can be accessed through the EWC website. The Distinguished Alumni Award was first given in 1991, and is based upon exemplary achievement in his or her particular endeavor in life, to include academic, professional, and civic activities or other areas deemed to be appropriate and significant. The award is selected by the EWC Foundation. 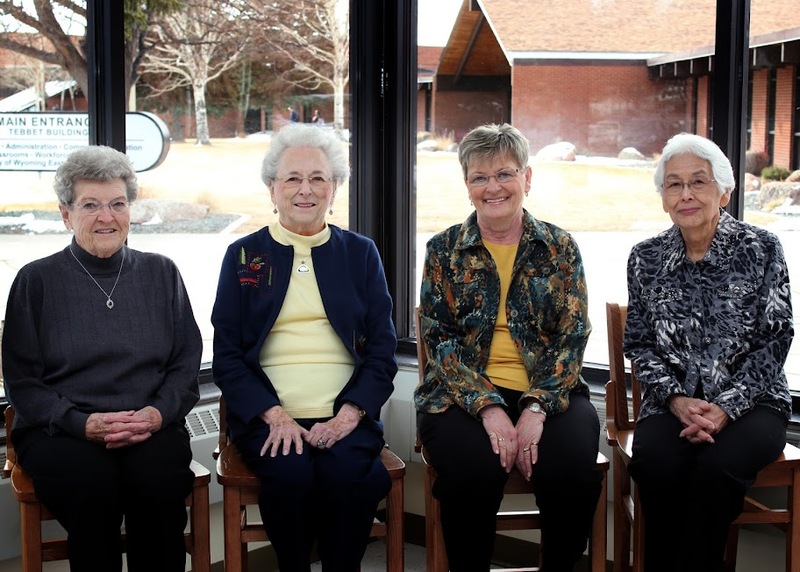 The Eastern Wyoming College Foundation is proud to recognize the following individuals for Distinguished Service: Pauline Deahl, Sharon Jones, Betty Hayano and Bev Yeik. Mrs. Deahl worked at EWC from 1961 to retirement in 1992 for a total of 31 years of service. She served as the Administrative Assistant to the Business Office and secretary to the Board of Trustees. Mrs. Jones worked at EWC from 1973 to retirement in 2005 for a total of 32 years. She served as the Administrative Assistant to President Chuck Rogers. She then went on to serve as the Payroll Manager. Mrs. Hayano served the College for 28 years from 1968 to retirement in 1996. She served as the Administrative Assistant to the Director of Student Services. Mrs. Yeik began working at EWC in 1965 on a part-time basis. She become a full-time employee in 1966 and retired in 1979. She served as the Supervisor of the EWC Work-Study Program. During this period of the College’s development and growth, all four served “where needed” on special projects, grant development and submission, payroll and human resources back up, community education, athletics, faculty support, statewide projects such as common course numbering, and development of College capabilities in transitioning from paper records to computerized record keeping. They supported presidents from Al Conger, Chuck Rogers, Guido Smith, Roy Mason and Jack Bottenfield. This award was first given in 2011 and is based on leadership and significant accomplishment in a college role as an administrator, faculty or staff member, member of the Foundation board of directors, and/or member of the general public to include individuals or individual corporate entities. The award is selected by the EWC Foundation. Recognition will take place at the EWC Commencement Ceremony to be held in Torrington on May 10th at 7 pm in the EWC Fine Arts Auditorium.